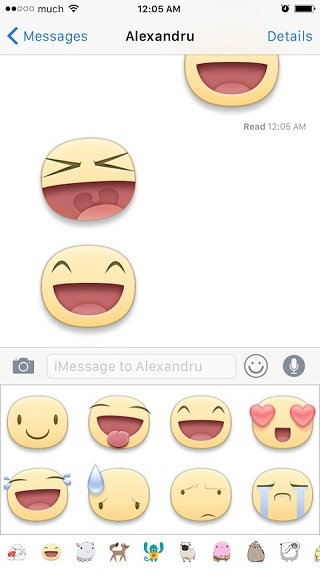 Facebook Messenger app for iOS features some really nice stickers that allow you to express your feelings in a funky way. People who absolutely love using these stickers complain not having them on other applications. If you have been wanting to have Facebook Messenger app’s stickers in iMessage application then the new StickerMe tweak can help. With this hack installed you can send all the stickers by simply selecting them from the keyboard area. Needless to say, you will need to have FB Messenger app installed on your device in addition to downloading StickerMe to be able to use the stickers. If you and the person your are sending the stickers to both have StickerMe and FB Messenger installed then they will appear just as they do in the official application. However, if the other person does not have the tweak or app installed then he or she will receive a static image of the sticker, which is also enough to convey your message or emotion and spice up your conversations. More details about this are available in Cydia tweak’s description page. You can download StickerMe tweak from Cydia for free. It requires iOS 8 to run and only supports iPhone and iPod touch. iPad is not supported yet.